The San Antonio Spurs currently lead the league in defensive efficiency, allowing just 95.3 points per 100 possessions, according to Basketball Reference. With the league averaging 105.1 points per 100 possessions overall, the Spurs are ten points above the league average on defense. They are better at defense than the Warriors are on offense, as Golden State is currently nine points above the league average, with 114.3 points per 100 possessions. To illustrate what an outlier the Spurs are on defense, I will use the advanced per possessions statistics tool to examine the Spurs' defensive efficiency and what drives it. 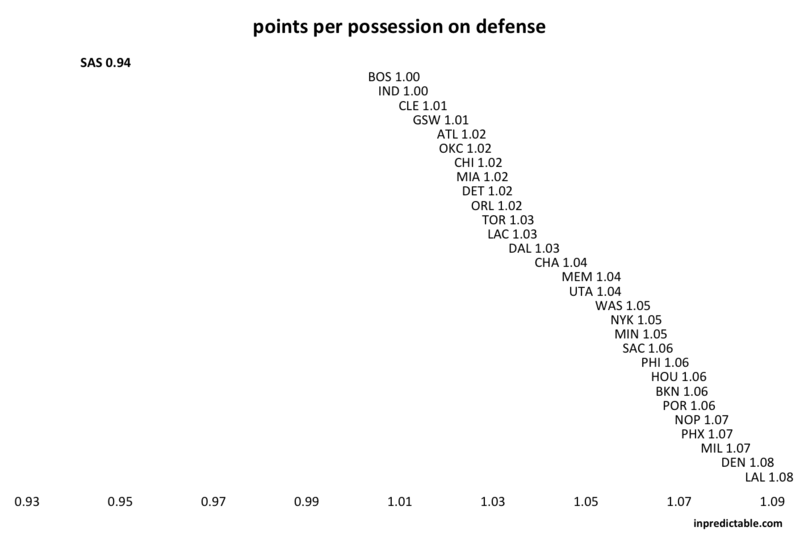 Here is a chart for overall defensive efficiency (note that these numbers differ slightly from basketball reference, due to oddities in the play by play data and the exclusion of technical foul points). 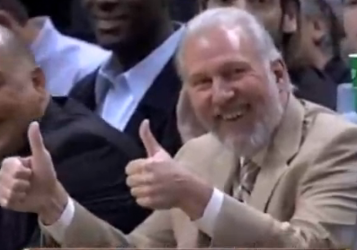 There are bad defensive teams, there are good defensive teams, there's a yawning chasm, and then there's the Spurs. The Spurs, while leading this category, aren't quite the outlier they were in the overall chart. 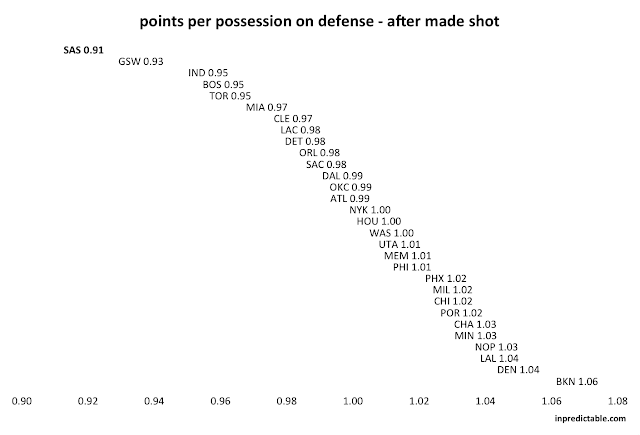 So, what other possession types are driving the Spurs' stifling defense this season? On the eve of the 2015-16 season, Spurs coach Greg Popovich set out to improve his team's transition defense. Last season, the Spurs were bounced in the first round of the playoffs by the Los Angeles Clippers. The Spurs were up 3-2 in that series, but dropped the final two games thanks in part to what Popovich called the "worst transition defense in the history of basketball in those two games". When the possession-ending event comes before the defense sets following a possession change and a transition from one end of the court to the other. The NBA also tracks fast break points as part of its official game books, but I have not found a precise definition of what counts as a fast break. I imagine it is a "I know it when I see it" situation for the scorekeepers, much like assists. An alternative way to measure transition defense is to examine the types of possessions that lead to transition opportunities and fast break points. The most common fast break opportunities occur following a live ball turnover. 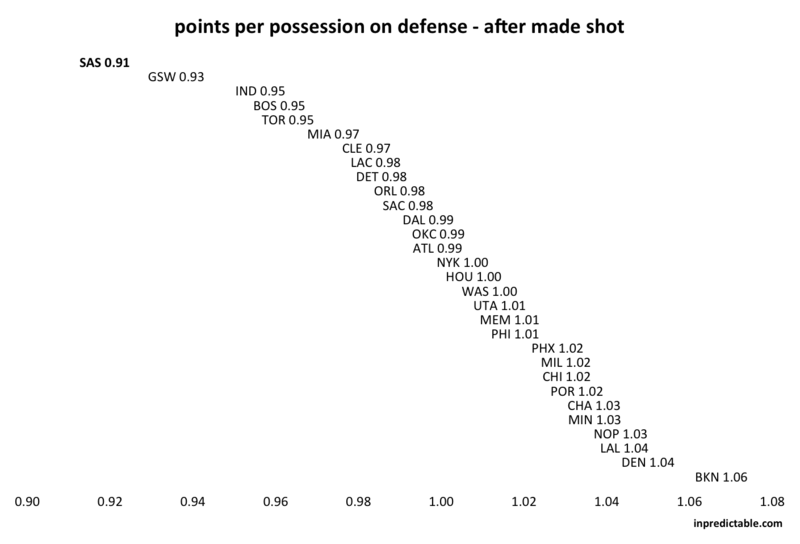 These possessions have the greatest likelihood of a team gaining possession upcourt with a numbers advantage. The advanced per possession statistics tool tracks efficiency following live ball turnovers and, as one would expect, these tend to be the quickest possessions - 9.7 seconds on average this season, compared to 14.9 seconds for all possessions. 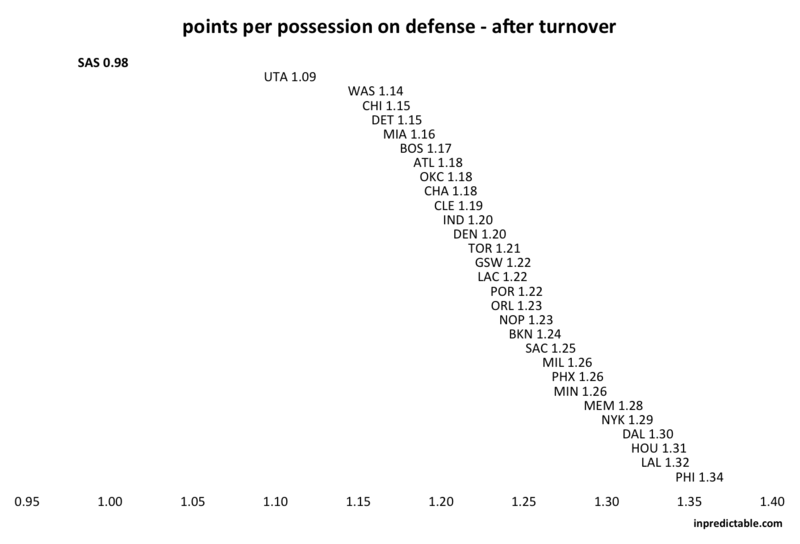 To put this in context, the Spurs have better defensive efficiency off of turnovers (the most efficient possession type) than any other NBA team manages on all possessions. Going back to the 2009-10 season (the furthest back my database currently goes), the best defensive team following live ball turnovers was the 2011-12 Philadelphia 76ers, who managed to allow 1.06 points per possession, which is still well above the Spurs' current 0.98 mark. 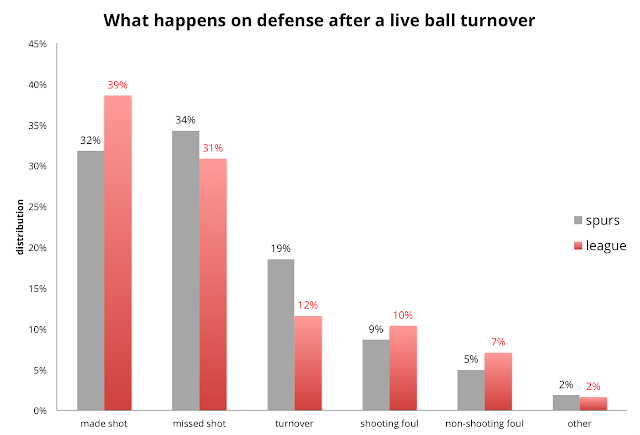 The following chart summarizes what happens following a live ball turnover, both for the Spurs and for the league overall. While the league allows a 55% field goal percentage immediately off of turnovers (=39/(39+31)), the Spurs still hold their opponents to below 0.500, with a 48% field goal percentage (=32/(32+34)). The Spurs also foul less, with only 14% of possessions resulting in a foul (shooting or otherwise), compared to a league average of 17%. But what may be most telling is the turnover rate. The Spurs are the indian givers of the NBA, forcing a turnover on defense 19% of the time, compared to a league average of 12%. Fast break opportunities can also occur following a defensive rebound, though the likelihood is less than that for a live ball turnover. The Spurs dominate this category as well, perhaps in part to their willingness to eschew offensive rebounds in favor of falling back on defense. It is clear from these numbers that the Spurs are a stellar defensive team on all fronts, whether in standard half court sets, or when defending the fast break. 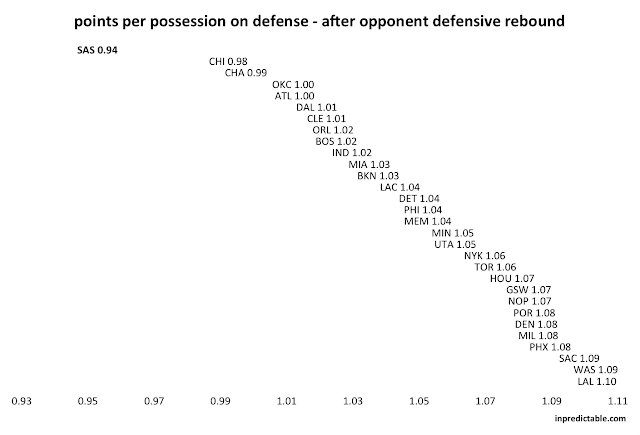 But their transition defense, as measured by efficiency following turnovers and defensive rebounds, is the difference between a league leading defense and a potentially historically great defense.